Let's start by making sure we understand the terminology we will be using in our discussion today. Too many times I hear people use these terms in the wrong and often confusing context. 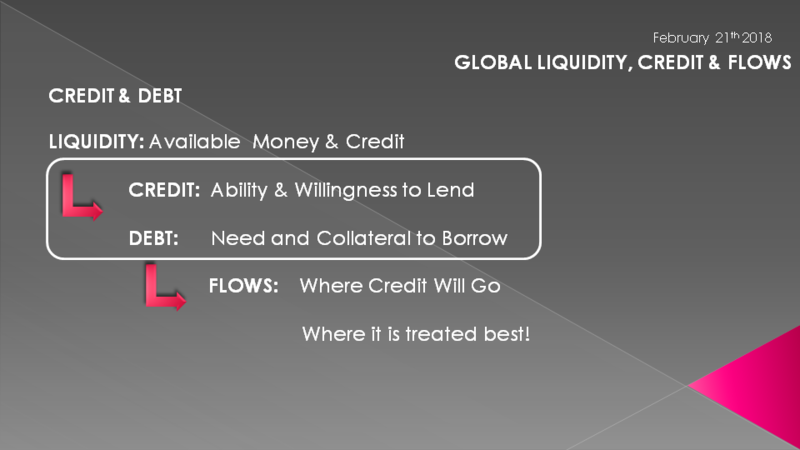 LIQUIDITY: is about AVAILABILITY of Money & Credit. This is the role of the central bankers, that is to ensure there is always sufficient but not excessive Money Supply available. 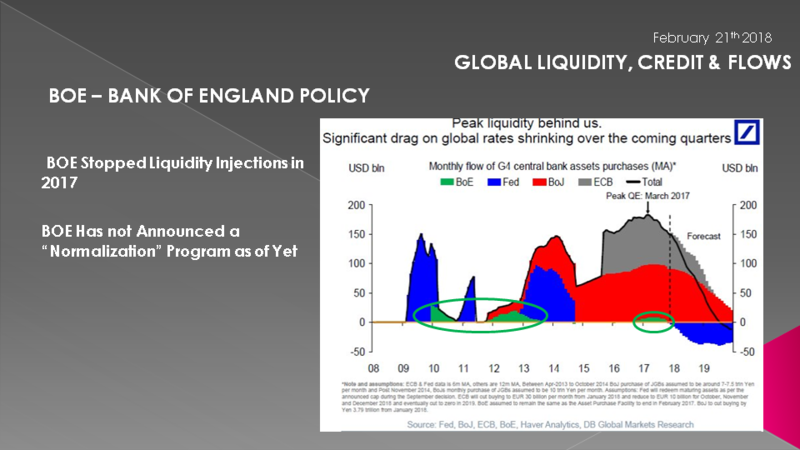 Historically the problem was normally insufficient liquidity. 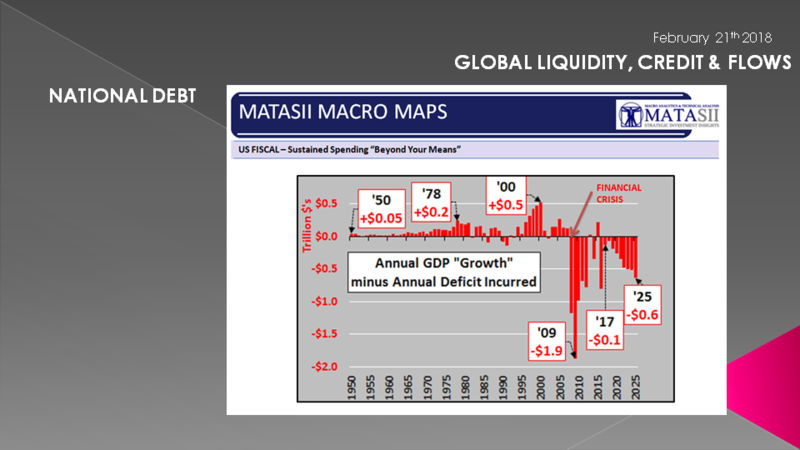 In the last two decades it has become more a matter of too much liquidity causing the problems. Monetary policy too loose for too long a period of time. The role of the central bank had been to take away the punch bowl just as the party got going but before it got out of hand. Not the case today. As a matter of fact it seems quite the opposite - but that is for another discussion. CREDIT: Is about Lenders having the ABILITY and the WILLINGNESS to Lend. 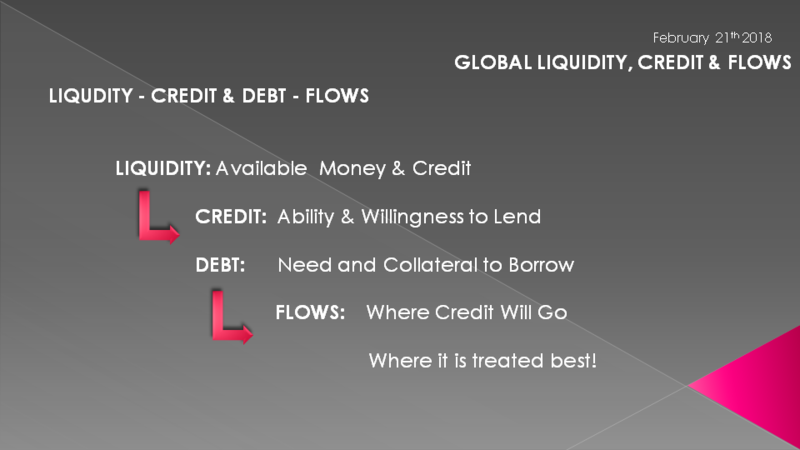 DEBT: Is about the NEED for and have the COLLATERAL or credit rating to Borrow. 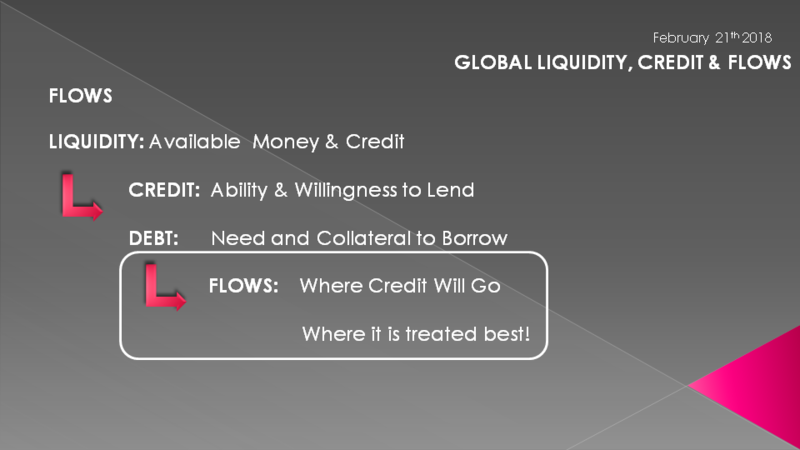 FLOWS: Is about where Money & Credit will go fully realizing it always goes where it is treated best. We are going to explore all of these in the discussion on a Global context. This is another important point because we too often don't properly distinguish whether we are talking domestically or globally - too often assuming in America they are one and the same. Today the Global context is critically important because as far as these terms are concerned there are no longer any borders and move at "light speed" around the globe as electronic "bits". 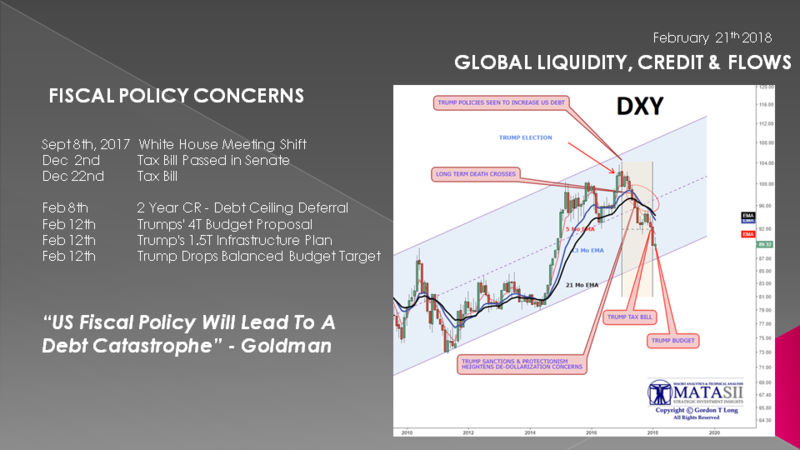 First, starting with Liquidity we need to fully understand that we are in the process of a global regime change regarding specifically liquidity injections by the central banks into the global economy. 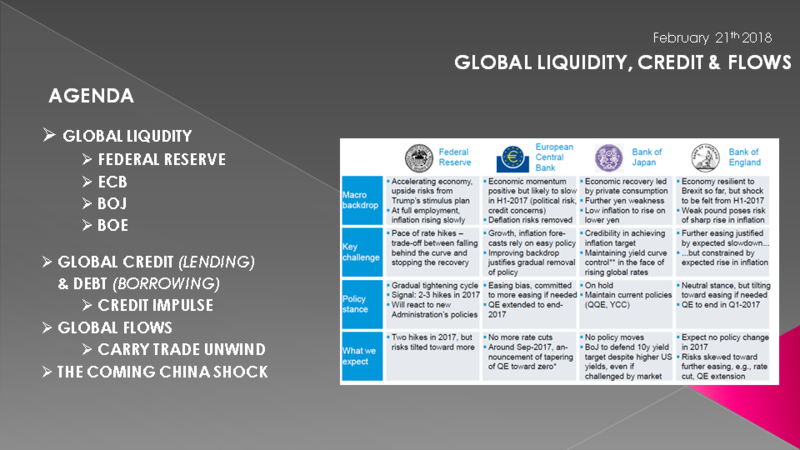 Since the 2007-2008 Financial Crisis (GFC) we have experienced unprecedented levels of liquidity injections by the central banks. 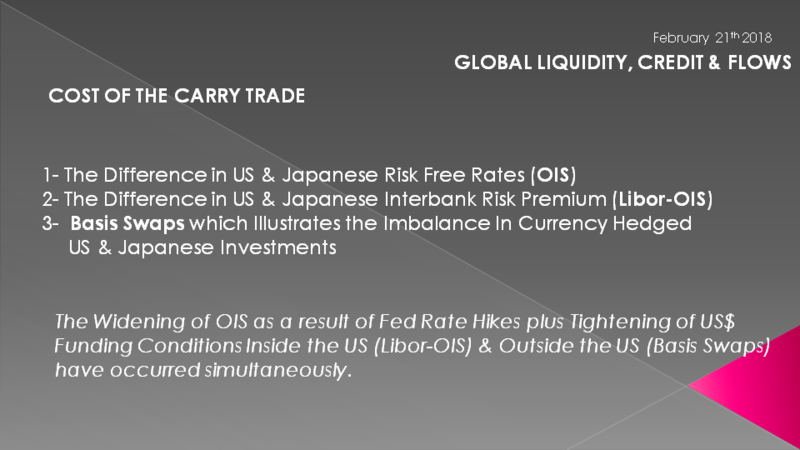 Prior to the GFC it was primarily about Japan's massive injections and the Japanese Carry Trade it fostered. 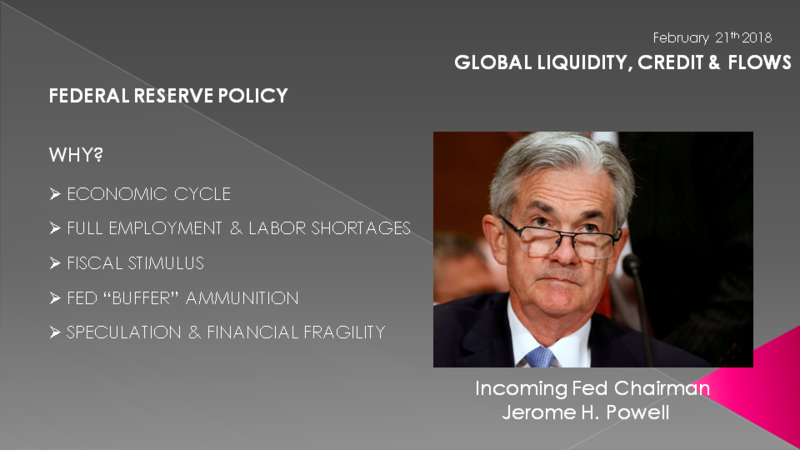 After the GFC it was initially the Federal Reserve's adoption of various versions of Quantitative Easing and Operation Twist, followed in 2012 with the European Banking Crisis and the ECB / BOE joining the Fed & BOJ. 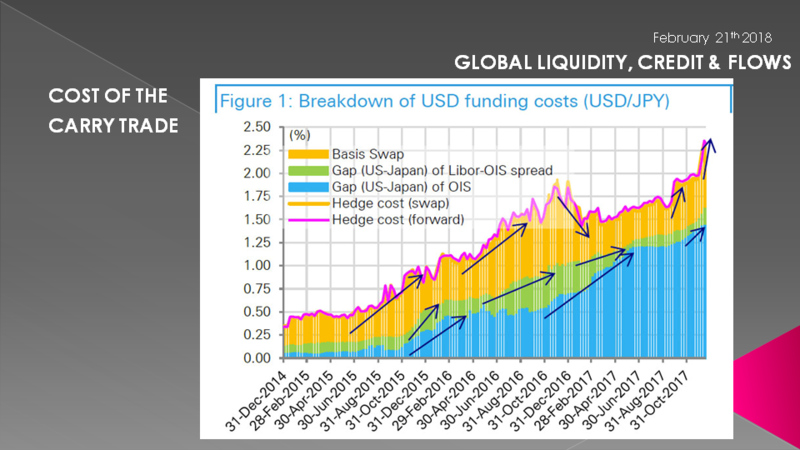 Both the ECB and Japan however took it to completely an other level in early 2016, with global liquidity injections of~ $200B/Mo with subsequent highs approaching $250B/mo in 2017. Today the Fed has stopped (which it did with the culmination of TAPER in the fall of 2014) along with the Bank of England (BOE). However the others are still injecting (though more slowly) at a rate that approximates $135B/Mo. This is a gigantic rate even compared to the the peak of US QE programs. It is important to remember, as in this chart and the others we are about to discuss, that China (People's Bank of China) is not included. There are technical reasons for this and consequentially we will discuss China separately. 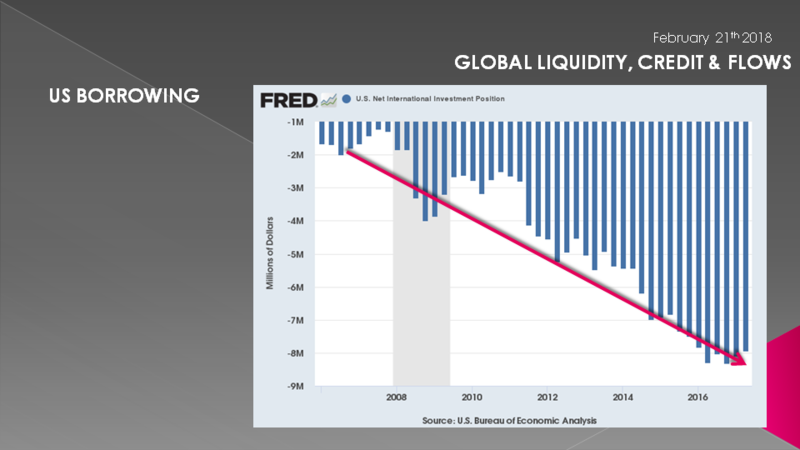 The Federal Reserve has not only stopped stopped Liquidity injections through QE programs, but has now went into reverse. 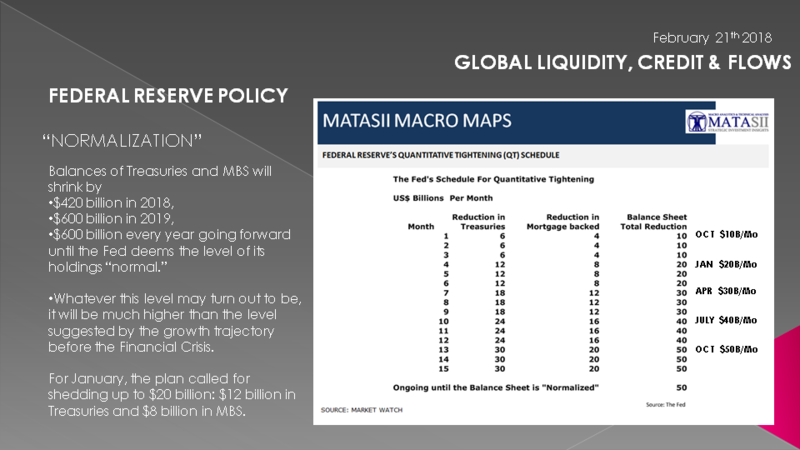 US Quantitative Tightening (QT) or "Normalization" is now withdrawing liquidity from the system. 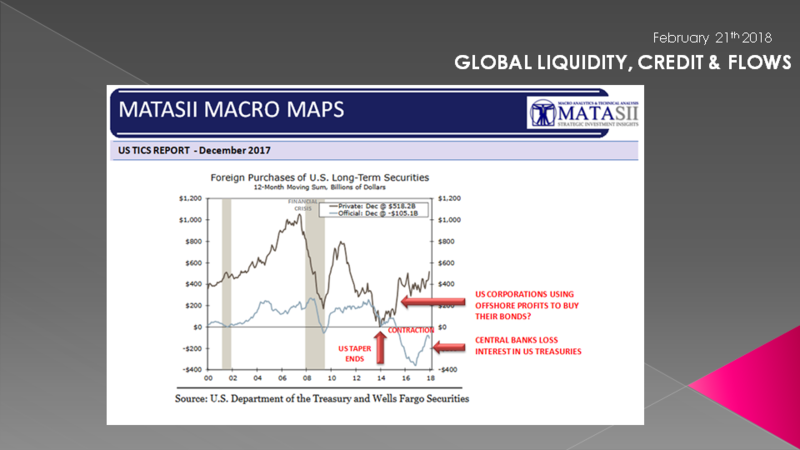 Balances of US Treasuries Bills / Notes & Bonds as well as Mortgage Backed Securities (MBS) are planned to shrink by $420B this year, $600B in 2019 and $600B every year going forward until the Fed deems the level of its holding "normal". Whatever that is? Prior to GFC the Fed's Balance Sheet approximated $1.5T and peaked before "Normalization" at ~ $4.5T. In January just completed the plan called for the shedding of $20B - $12B in US Treasuries and $8B in MBS. 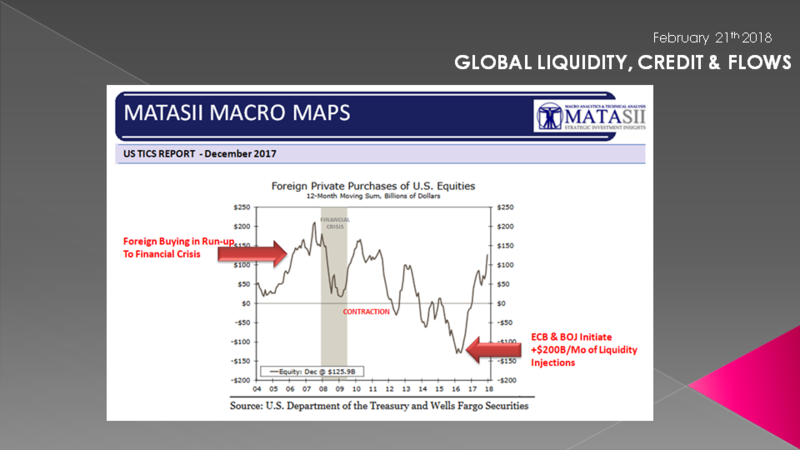 My colleague Richard Duncan uses what he terms the "Liquidity Gauge" to assess US Liquidity levels in his Macro Watch reporting. He is presently highly concerned with the path the Federal Reserve has embarked on shown here for 2018-2020. He believes it is ill framed and if maintained will plunge the US into a deep and protracted Recession. 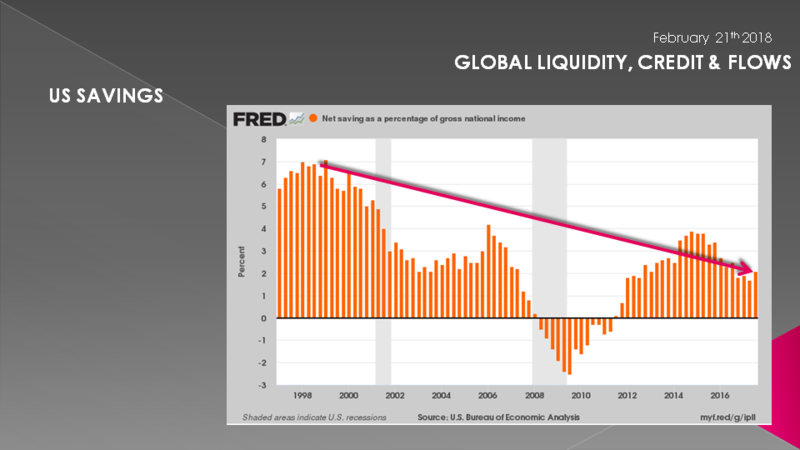 But the problem in the US is worse than this because the Federal Reserve is raising rates at the same time, which additionally reduces liquidity by paying the banks more to keep their reserves on deposit with the Fed versus lending them out - unless of course longer rates rise substantially. 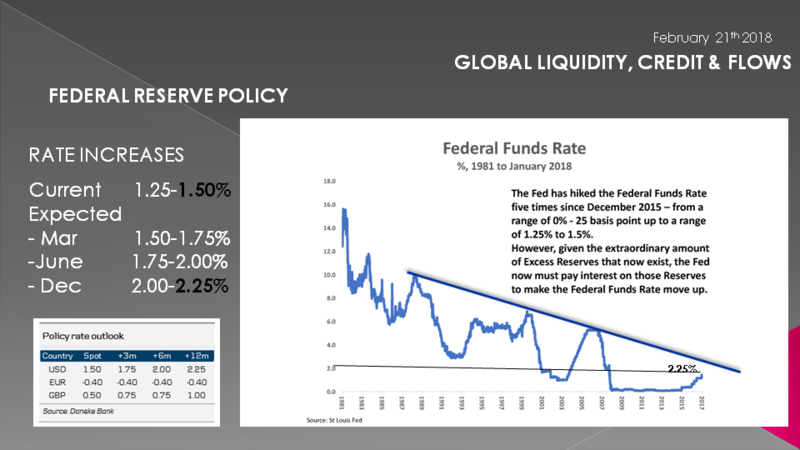 Both policies of "Normalization" and raising the Fed Funds Rate can be expected to result in slowing money supply grow. The Fed is currently setting expectations for three more rate increases in 2018 as shown here. You will notice the trend line I have drawn in. There is a level at which these rates will stall the economy. A rate that has been consistently falling. This boundary condition approximates 3-3.5% on the 10Y UST. Many well know experts are on record as saying 2.65% and 2.85% on the 10Y UST will bring about a stock market correction. As we talk it the 10Y UST is 2.91%. This is not a very pretty picture for the US, but the Fed sees it has no choice. Why? They see we are late in the economic business and credit cycle which has been longer historically than all but one. The amount of fiscal stimulus now being brought by a new Tax Bill, Trumps massive unbalanced budget, A $1.5T proposed Infrastructure Bill and ~$80B in Hurricane relief can only be seen by the Fed as ensuring inflation which they must be prepared to contain by getting out in front of it. The level of excess leverage, speculation, over valuations and financial fragility must have the FOMC worried. I suspect that the Fed feels it can tolerate a stock market sell off if it has too to achieve the required buffer. However, it can not withstand the debt market imploding which many including myself are more worried about! I also sense that the Fed would no doubt prefer to head into the next downturn with not only this historical rate buffer, but additionally with equity markets lower and with less elevation to suddenly plummet from and the Fed expected to restore. The European Central Bank (ECB) has also begun reducing its rate of liquidity injections. It reduced its monthly bond purchases from 60B Euros to 30B Euros in January. 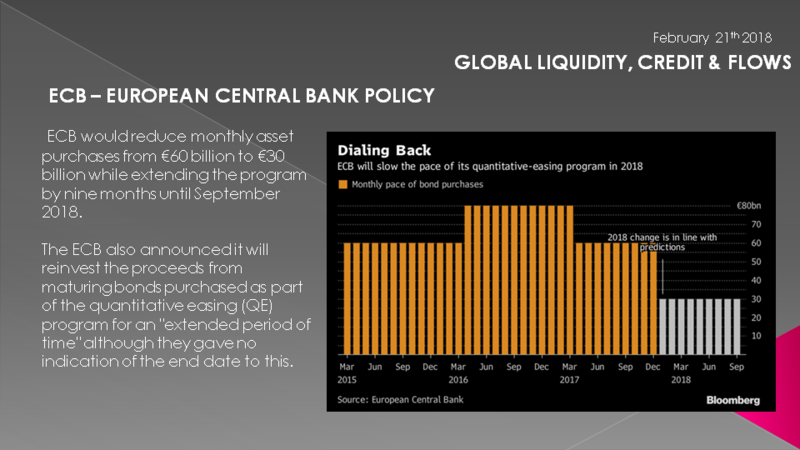 It will continue at this rate until September 2018 at which time liquidity injections go to zero or are possibly extended a little longer at the 30B Euro/Mo.. The ECB has not as yet announced a "normalization" program for its ballooned ~$4.5B balance sheet. In case all of this this is beginning to worry you - it gets worse - at least as far as what their stated policy objectives are concerned. The Bank of Japan (BOJ) is also sending signals it, may begin reducing its rate of injections, but presently are seen to be simply maintaining their existing rate in 2018 (shown here in red). 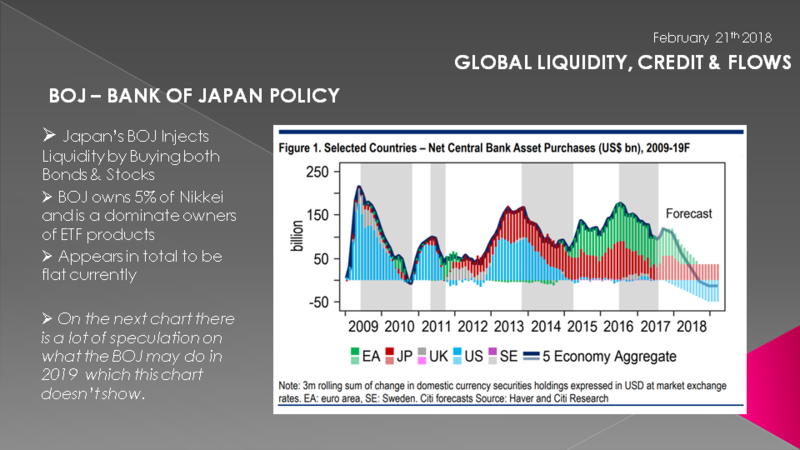 There is a lot of speculation on what the BOJ will do which is not shown on this chart - remembering that it is also buying NIKKEI stocks and now is reported to own ~5% of NIKKEI stock equities -primarily in the form of ETF ownership. This chart shows forecasted levels for the BOJ for 2019 in red. Also potentially quite dramatic. The Bank of England highlighted in green, as I mentioned earlier, has stopped injections altogether but has not announced a "Normalization" program. Of course all of this can change very quickly if economic projections are not found to be as good as they are currently forecast to be. There is little double in my mind that this will be found to be the case. The question is when will the Central Banks determine this and how bad will things get first. Also whether they can effectively do anything about it when and if something unexpected might occur. 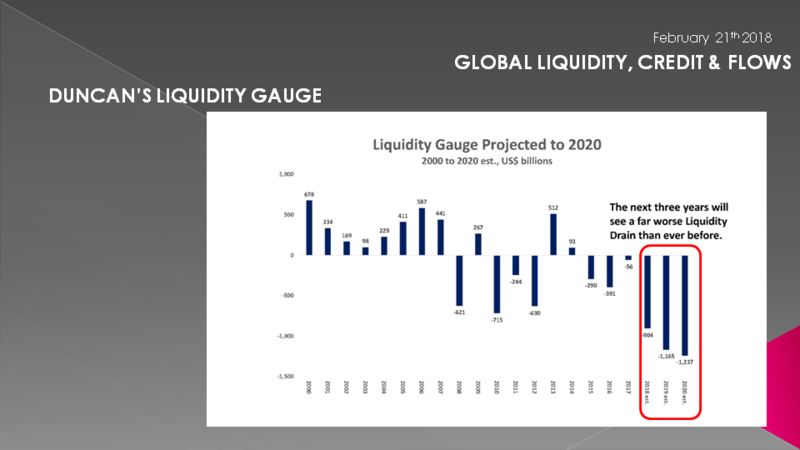 So we do know with relative certainty is that global liquidity is going to significantly tighten in 2018. We are in the process of a major economic regime change. What about Credit & Debt? What is going on there and what might we expect? It likely comes as no surprise to most of our listeners that the rate of savings in the US is steadily falling. However, when we refer to savings we too often think of it only in the context of Household Savings. It is broader than that. Savings also includes profits from business entities. Corporate profits which are eligible to be reinvested into productive assets or used for whatever purpose. Today profits are predominately ear marked for corporate stock buybacks and dividend payout - not capital investments. This is been a mainstay buyer in the markets for over 5 years now. As you can see the total of the two together is still falling. That would be fine if borrowing was the same or less. Here we see this is not the case. US borrowing is increasing at a dramatically larger rate than savings! As a consequence the US must borrow from foreigners to finance its borrowing. Again this is likely no real surprise. What may be a surprise is that when we subtract the annual government deficit from total US Economic GDP we now get a dramatically negative number. It is much worse if we add the total deficit between savings and borrowing (not just government deficit) . This says the situation is unsustainable in the long term. But what is the long term because it has been going on for awhile now? 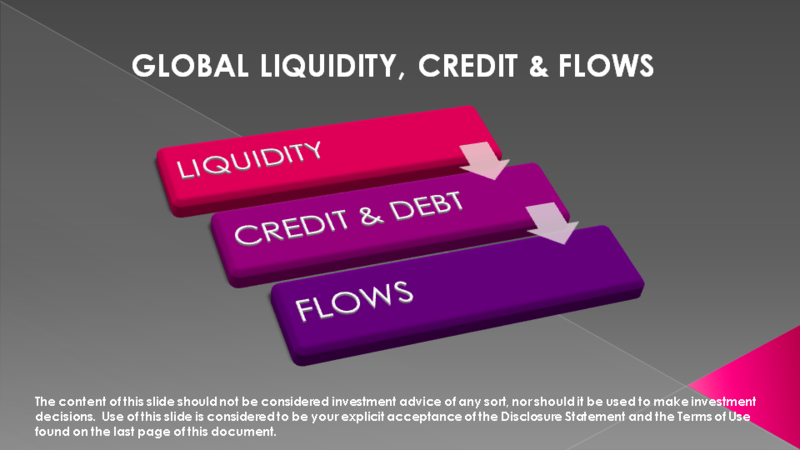 The answer lies, as you will see when Global Flows, no longer head to the US as investment to satisfy borrowing needs. That coming shift has a lot to do with the size of the total debt (Public & Private) in relationship to the size of the economy or the economies ability to sustain payments. A big part of the sustainability is the public sectors ability to tax the private sector and the private sectors ability to pay. Well that number is now over 300% of GDP with the national Public debt at ~21T and estimated to be headed towards ~30T within 10 years. can it be paid? Very importantly in determining that is - at what rate of interest? Remember that $3oT deficit number doesn't include unfunded entitlements and contingent liabilities associated with the Fiscal Gap! Again it is worse. We are now starting to get to the rub! The chart on the right is the US Trade weighted Dollar chart or DXY. You can see at the top a red arrow showing when President Trump was elected. The DXY has been falling ever since. Why? There are number of reasons but one is his reflationary policies that are seen to be a problem for lenders willingness to lend. The risk of lending has increased and that is being addressed by reducing the value of what their loans will be paid back in. Last fall, on September 8th, 2017 there was a high level meeting of congressional leadership at the White House. 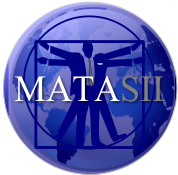 I believe it was a secret meeting (I posted all the details at MATASII) for congressional leader to face the stark realization that there was an urgent and growing need for the US to stimulate in a massive way so a US recession or possible global recession could be averted. Close to $80T is hurricane and disaster relief for Texas, Florida, Puerto Rico & CA. Removed the debt ceiling for two years through a CR full of Republican and Democratic spending of ~60-80B for each of the parties bet programs. Trump Announce a budget that completely removes any semblance of being a balanced budget which republican fiscal conservatives campaigned on and was thought to be the cornerstone of Republican policy. A budget that with extremely optimistic economic projections and no recession still takes the national deficit to ~30T. Well none of this is good news. But we are so far only talking US borrowing needs. What about the foreign lending to the US? 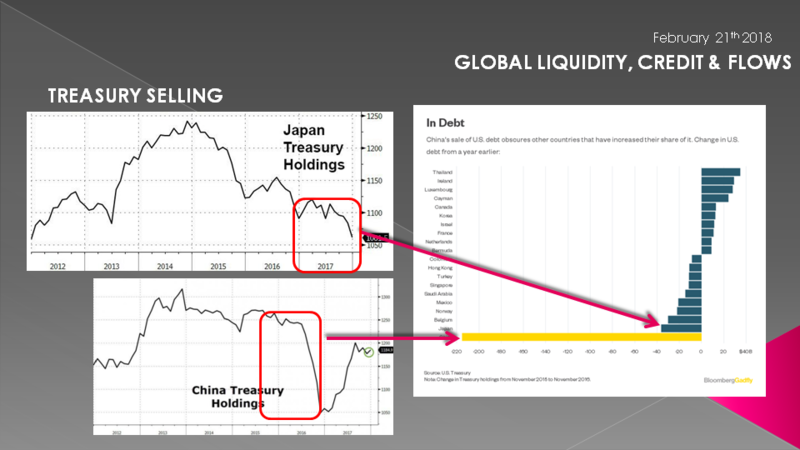 The problem here is that the US is leaning into a storm where it's largest creditors (Japan and China) have been selling US Treasuries! Presently, (in the case of Japan) in a big way! As a consequence, Moody's is threatening a US Debt downgrade despite they and the other credit rating agencies suffered the incredible predatory wrath of the US Government the last time they did this!. It must be very serious for them to challenge the gods knowing full well it will mean being impaled in some sort of fashion? Back in 2011, Standard & Poors' shocked the world, and the Obama administration, when it dared to downgrade the US from its vaunted AAA rating, something that had never happened before (and led to the resignation of S&P's CEO and a dramatic crackdown on the rating agency led by Tim Geithner). Nearly seven years later, with the US on the verge of another government shutdown and debt ceiling breach (with the agreement reached only after the midnight hour, literally) this time it is Warren Buffett's own rating agency, Moody's, which warned Trump that he too should prepare for a downgrade (from the#1 rater that was smart enough to keep quiet in 2011). 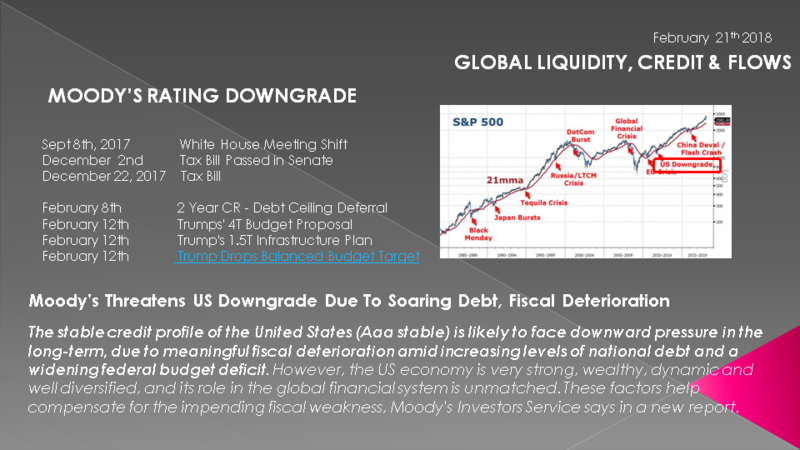 Moody's reason: Trump's - and the Republicans and Democrats - aggressive fiscal policies which will sink the US even deeper into debt insolvency, while widening the budget deficit, resulting in "meaningful fiscal deterioration." In short: a US downgrade due to Trumponomics is inevitable. Even without it, global lenders know the reality of the risk of lending to the US with their printing presses and a President who built a career on debt and acknowledges proudly that he is the "King of Debt!". It is tough to change a zebra's strips and global lenders see that clearly! 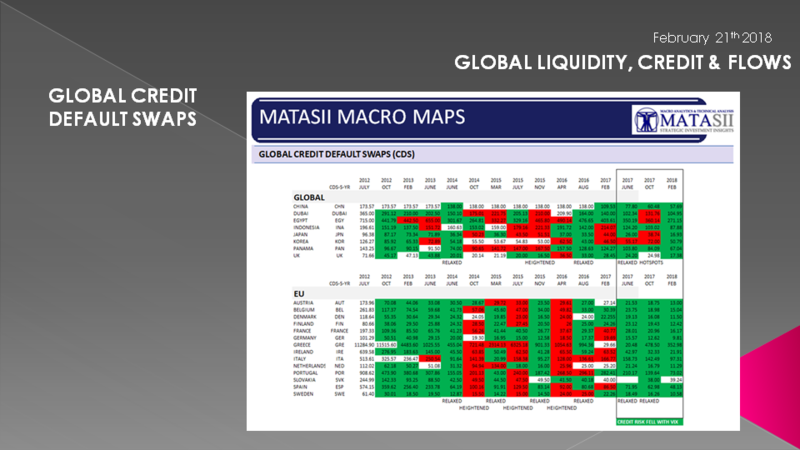 At MATSII we track changes in Global Credit Default Swaps to give us advance warnings of problems in the Credit Markets. As you can see from this historical grid CDS are at extremely low levels and nothing appears wrong. Actually it is quite the opposite. Risk is determined historically based on the risk free benchmark which is the US 10Y Treasury Note. This has been controlled and managed down by central bank buying since the GFC. That is about to change. Overlaid on that is thew VIX which is a measure of volatility risk measured by option pricing. As the world discovered on February 5th this has been manipulated heavily by various ETF & ETN instruments. As the VIX settles at likely a higher new normal after the recent shock, risk will be remodeled upward. 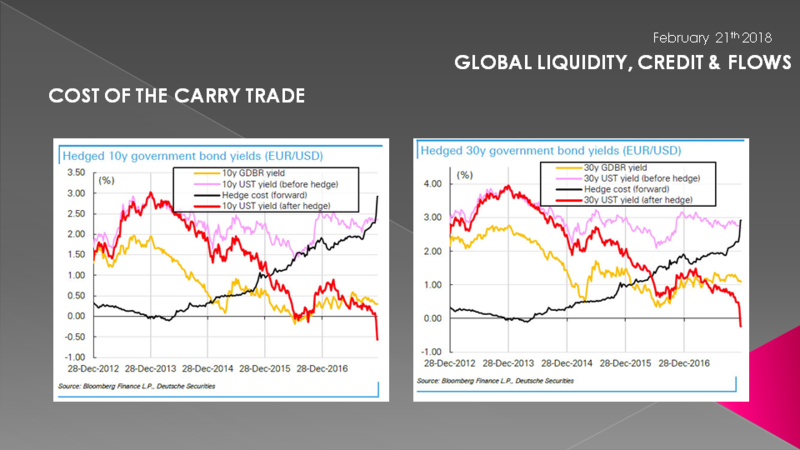 We are already seeing this in Risk-Parity Funds and the HY Bond areana. There is much more to come here, but suffice it to say that these green boxed will soon be all red! You can almost see the cycle in this table. Another instrument we watch is the Credit Impulse. This is the derivative of changing rates of credit growth. On a global basis the real creator of Credit has been China which so far we have not mentioned. They are attempting to reduce credit growth in a significant way. If they continue on their current path we have a massive credit problem! I am skeptical they will but nevertheless we will see growing global credit stress. Let's shift to Flows. Money goes where it is treated best to supply the Credit for desperate borrowers and debt addicts. I think the recent market turmoil is instructive. I showed earlier that Japan is selling US Treasuries. Remember that these treasuries are owned by the BOJ as FX Reserves, Japanese Banking Institutions desperate for Yield and a hugh Japanese private investment community. Japan has been in some form of the QE business for over two decades and out of it emerged the infamous Japanese Carry Trade. Borrow at NIRP in Yen with a falling Japanese currency and lend Internationally at higher rates in rising or strong currencies like the US dollar. However, when things get chaotic in foreign markets and investment risk rises the Japanese private investment community famously retreats home - quickly. The Carry is quickly taken off. When this happens normally the dollars falls as foreign US$ denominated assets are sold with the yen rising with repatriation. This is exactly what has been occurring for awhile now regarding US Treasuries which is helped push yields higher. However, there is more going on than just that. Secondly, since Trump there has been steady capital losses on 10Y US Treasuries as Yields have climbed and the US dollar fell (which we showed earlier since Trump assumed office). Thirdly, the Carry is now costly as a result of suddenly imploding USDJPY. 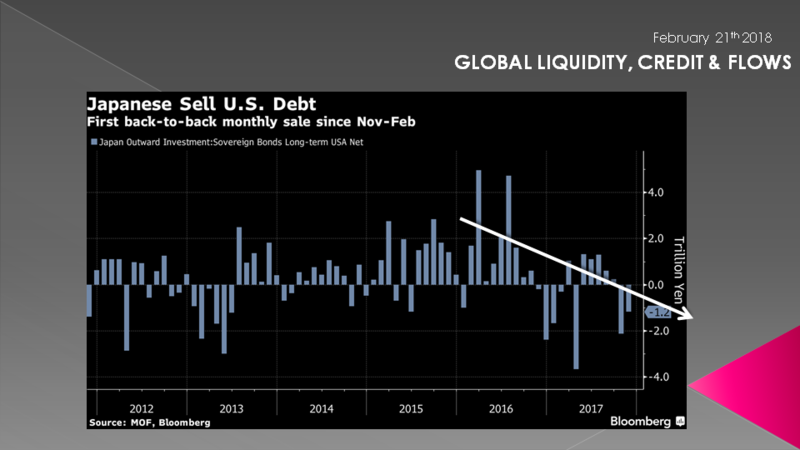 There has never been a worse time to buy US Treasury's for Japanese investors, traditionally some of the most ravenous purchasers of US paper. (3) Basis Swaps, which illustrate the imbalance in currency-hedged US and Japanese investments. 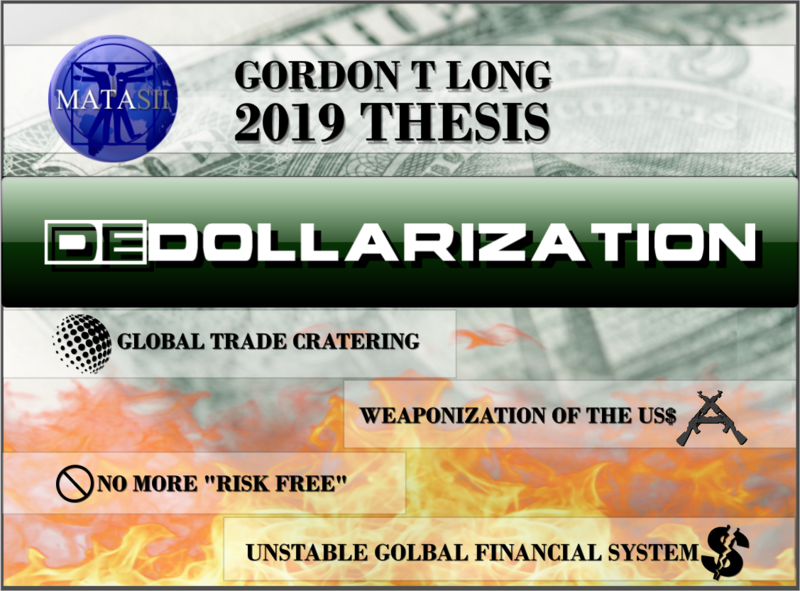 In this particular case, widening of (1) as a result of Fed rate hikes and tightening of dollar funding conditions inside the US (2) and outside the US (3) have occurred simultaneously. 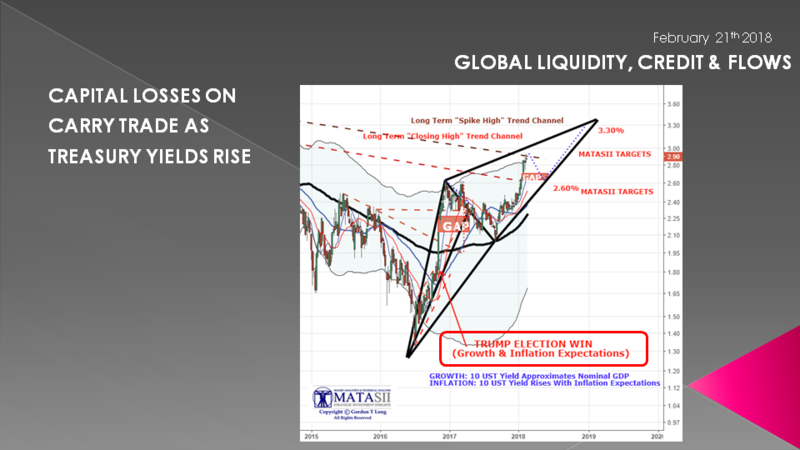 This is illustrated in this chart taken from ZeroHedge which they published in an article when Trump signed the Tax Bill entitled: "In An Unexpected Outcome, Trump Tax Reform Blew Up The Treasury Market". Whatever the cause behind these sharp funding shortages, one thing was clear - dollar funding costs (FX hedging costs) for both Japanese insurers, banks and other investors to buy US Treasuries were surging with Japanese buyers and reached a post-financial-crisis high of 2.35% on 15 Dec. And in terms of practical implications for the treasury market this means that, all else equal, marginal demand for US paper is about to plunge for one simple reason: the FX-hedged yields on US Treasurys have plunged to (negative) levels never seen before (unless of course foreign investors buy US Treasurys unhedged). To demonstrate this point, the chart below from Deutsche Bank shows the yields on currency-hedged US Treasuries from the perspective of Japanese investors. Annualized hedge costs had risen to 2.33% at the end of December, which means that investments in 10y US Treasuries would result in virtually no yield. Furthermore, yields from investment in shorter than 10y US Treasuries would be less than JGBs and result in negative spreads. 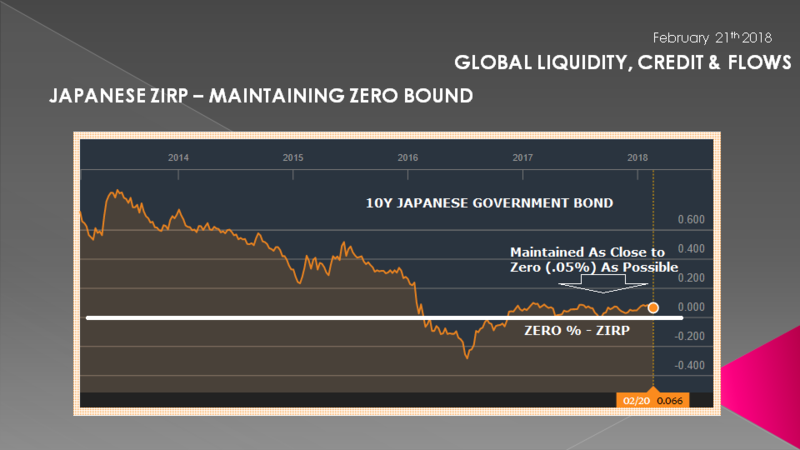 Fourth: there is a need for money to continue to maintain zero percentage on the 10Y Japanese Bond as pressures mount for the natural rate to increase. But to be sure it isn't just the Japanese Carry Trade. Central Banks overall have been steadily losing interest in holding US Treasuries. That could be for a number of reasons including pressures on their own FX Reserve levels. Saudi Arabia is a good example of that with the pressures on them to maintain a dollar PEG. 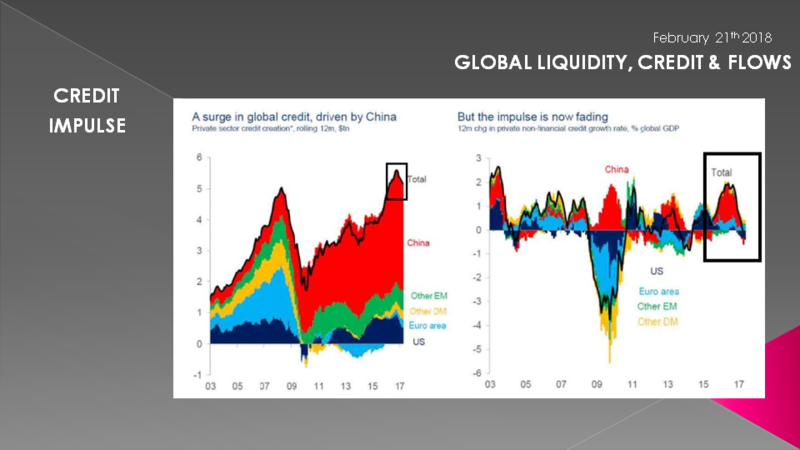 Global Flows are only beginning to change. Charts like this will soon see a change in direction. I have intentionally stayed away from China who are the worlds largest creator of Credit because what they will do going forward is almost impossible to quantify. 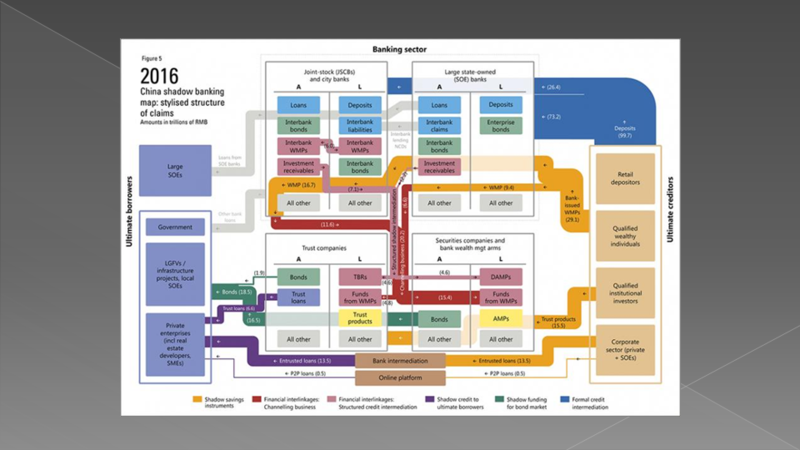 There are a number of reasons for this ranging from government control of banking, exchanges & SOEs, to questionable statistical reporting to the shear complexity of their Shadow Banking System attempted to be shown here. It is anyone's guess on what they will do. 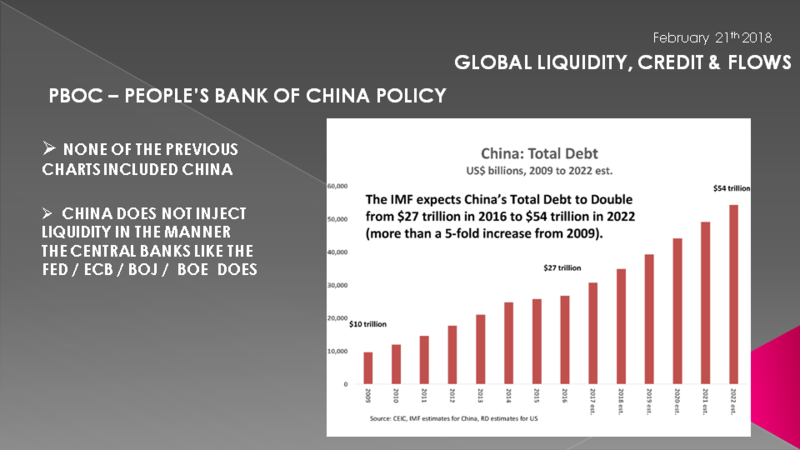 The IMF expects China's Total Debt to DOUBLE from $27T in 2016 to $54T in 2022 - just around the corner. That is more than a five fold increase from 2009. 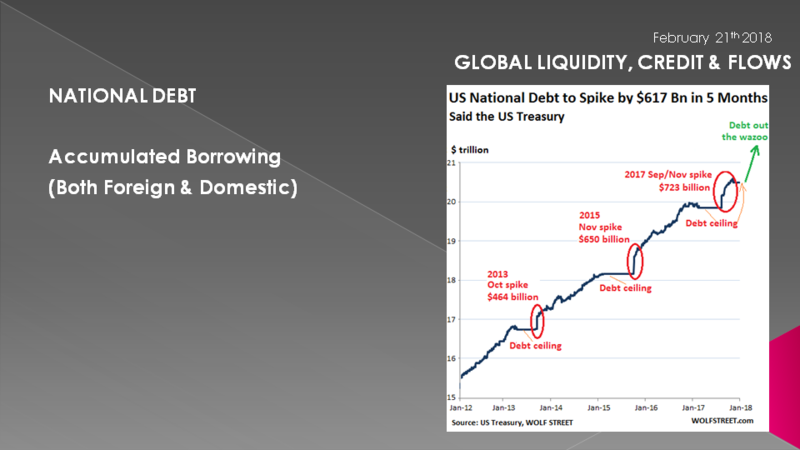 How will this debt be financed with pressures already on their FX Reserves with them selling US Treasuries? Richard Duncan is as close to China as anyone, though he lives in Thailand and works in Singapore. 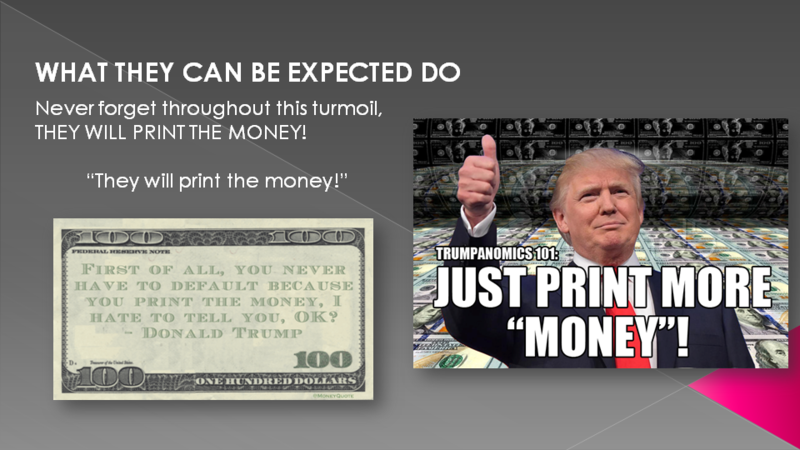 He thinks they will just issue Credit by literally printing their currency not backing it by anything. China no doubt has learned learned form the US. A cheaper Yuan which will result from this is something they they want and need anyway. 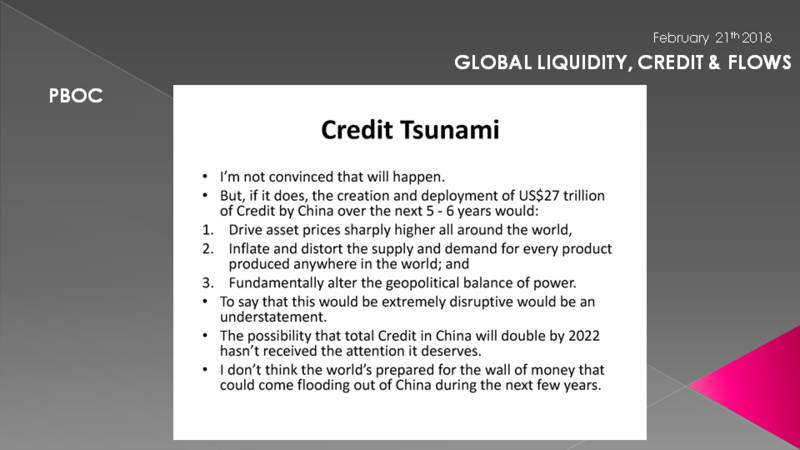 As Richard warns: "the world is not prepared for the wall of money that could come flooding out of China during the next few years!" With a world increasingly desperate for Credit , China may be their savior. Could they be the source of the next "reflasionary" central bank push? But at what price? ?